Connect your Plone/Zope installation to all ODBC compliant databases and data sources in a hassle-free, robust and scalable way - with our easy to use mxODBC™ Database Adapter for Plone and Zope. mxODBC Zope DA works on Windows, Linux, Mac OS X, FreeBSD, Solaris and AIX, providing you with the same interface, flexibility and robustness across all on all these platforms. Our new version mxODBC Zope DA 2.2 was specifically engineered to make it easy to install the adapter in the Plone 4.x and 5.0 versions. It fully integrates into the zc.buildout installation system used by these Plone versions and supports Python versions 2.6 and 2.7. If you need database access for older Plone/Zope releases, please consider using version 2.0 or version 1.0 of our mxODBC Zope DA product. These support Zope versions as old as Zope 2.3.
mxODBC Zope DA is made available as egg archives that can be installed via the zc.buildout installation system used by Zope 2.12 and 2.13. You can use the same installation instructions as for Plone to get the Zope DA installed. Fully compatible with Zope External Methods and Zope's built-in transaction mechanism: use Connection Objects in Python modules set up as Zope External Methods to all the features of the mxODBC Zope DA from Python and even tap into the low-level features of mxODBC within Zope's transaction mechanism. Full support of Stored Procedures: when using Zope External Methods, you have full access to SQL stored procedures, which allows direct integration with external database APIs. Full 64-bit Support: The underlying mxODBC 3.3 library fully supports 64-bit platforms such as Windows Server 2008, Mac OS X 10.6 (Snow Leopard) and 64-bit Linux systems. Compatible with all recent Zope and Python releases: Supports Zope 2.12 and 2.13; supports Python 2.6 and 2.7. If you need support for older Zope releases, please use version 2.0 or version 1.0 of our mxODBC Zope DA. Compatible with Plone 4.0 - 4.3 and Plone 5.0: The zc.buildout compatible installation process allows easy integration with your existing Plone 4.x and 5.0 installations. 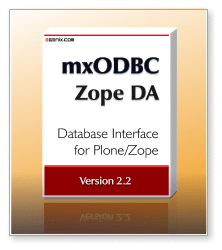 Based on mxODBC 3.3: The mxODBC Zope DA uses mxODBC 3.3 to connect Plone and Zope to ODBC data sources and provides access to many of its advanced features, as well as its robust ODBC driver compatibility. Compatible with all major ODBC managers: mxODBC 3.3 supports the Windows ODBC manager, the Mac OS X ODBC manager and the three most popular ODBC managers on Linux: unixODBC, iODBC and DataDirect. Per Connection Cursor Type: The ODBC cursor type used on the connection can be adjusted to the application's result set needs, ranging from the high performance forward only cursors to the slower but more predictable static cursors. The mxODBC Zope DA product is a commercial product and made available under the terms and conditions of the eGenix.com Commercial License Agreement, Version 1.3.0 (PDF file). If you are intending to upgrade from an existing mxODBC Zope DA license to the new mxODBC Zope DA 2.2, please contact the eGenix.com Sales Team with your existing license serials for details for an upgrade discount coupon. We will give out 20% discount coupons for upgrade purchases going from mxODBC Zope DA 1.x to 2.2 and 50% coupons for upgrades from mxODBC Zope 2.x to 2.2. After upgrade, use of the original license from which you upgraded is no longer permitted. You normally do not need to download these egg archives manually, since the easy_install script or zc.buildout will fetch the right archive for you. Please see the installation instructions for details. For some platforms, manual download may also be needed due to differences in platform name between our build systems and the target installation systems or due to missing support in setuptools to parse the platform string part of the egg archives. These files are made available to you under the terms and conditions of the eGenix.com Commercial License Agreement, Version 1.3.0 (PDF file). Please note: The Plone Windows installers ship with Python 2.6, so you only need the Python 2.7 builds in case you have a manually installed Plone/Zope version. These egg archives include the mxODBC Zope DA Zope Product and all necessary eGenix.com mx Products (including mxODBC 3.3) prebuilt for Plone/Zope installations in one binary archive. Please note: The Plone 4.3 Windows installers ship with Python 2.6, so you only need the Python 2.7 builds in case you have a manually installed Plone/Zope version. Earlier versions of Plone did not come with a 64-bit Windows installer at all. You will need to have one of popular ODBC managers for Unix installed on the target system: iODBC 3.52.x or unixODBC 2.3.x. We have successfully tested the Zope DA with iODBC 3.52.7 and unixODBC 2.3.2. If you are using unixODBC and getting linker errors about a missing libodbc.so.2, please see this posting for help. Products.ZSQLMethods which you can download from PyPI. This is a source code package and doesn't need to be compiled. ThreadLock which you can download from PyPI as source package or from our UCS2 or UCS4 egg indexes as binary packages for Windows, Linux and FreeBSD. Please see our ThreadLock distribution release announcement for details. If you already know how to install the mxODBC Zope DA, you can also follow the quick install instructions. Please note that these instructions are based on a typical Plone/Zope installation such as the one that comes with Zope and the Plone Unified Installer. Depending on your installation, the configuration files may require slightly different settings and parts. Adjust the URL used in the find-links directive to use either the ucs2/ or the ucs4/ version of the eGenix PyPI-style distribution index. Adjust the egenix-mxodbc-zopeda version to the one that you would like to use. Replace the ***license-serial***/ path component with the license directory containing the license for the instance you are configuring. The directories extracted from the license.zip file are usually named after the license serial, e.g. 2100-8789-0322-0926-2568-6429/. The ThreadLock egg which includes a Python C extension will be downloaded from our indexes as well. We provide binaries for all supported platforms to avoid the need to have a compiler installed for the buildout run. Please see our ThreadLock distribution release announcement for details. After a buildout run and restart of the Plone/Zope Instance, you will then find a new entry for the eGenix mxODBC Zope DA Connection object in the Zope Management Interface (ZMI) add object drop-downs. After a buildout run and restart of the Plone/Zope cluster, you will then find a new entry for the eGenix mxODBC Zope DA Connection object in the Zope Management Interface (ZMI) add object drop-downs. Please see the mxODBC Zope DA documentation for more details on the ZEO cluster installation. You will then need to install the license files by copying them to the lib/python/ directory of your Zope instance. ZopeMag product review of the mxODBC Zope DA (archived version). The mxODBC Zope DA is in production use on several high-volume Zope sites, among these some very well-known companies in the industry. Please write to sales@egenix.com for more information.